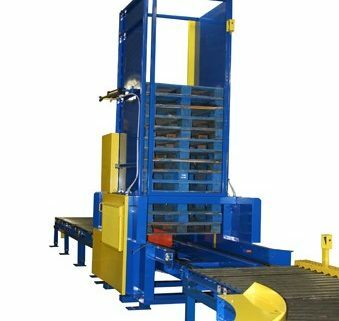 The Triple-Function Pallet Stacker & Dispenser is a high speed, electric pallet stacker, destacker, and accumulator designed to integrate with automated lines. It will stack a pallet every 5 seconds. 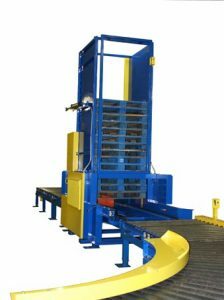 The Triple-Function Stacker & Dispenser is also a destacker and will accept an entire stack of pallets from powered infeed conveyor and dispense a single pallet every 6 seconds. 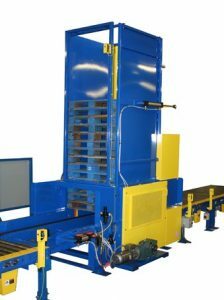 In addition to being a stacker and destacker, the Triple-Function Stacker & Dispenser can also be used as an accumulator to moderate flow on an automated system stacking pallets when the line is full, letting pallets flow through when the line isn’t backed up, and dispensing when needed.